Skopje is the capital and biggest city in Macedonia. The name of the town comes from the Greek word skopios, which translates to a tower, observatory, because of the former location of the city. Skopje was the capital of Macedonia since 1991 and is located in the northern part of the country. The area around is mountainous and hilly – the north of the city is surrounded by the hills of Skopje and to the south you can see the hills of the Mountain Water. 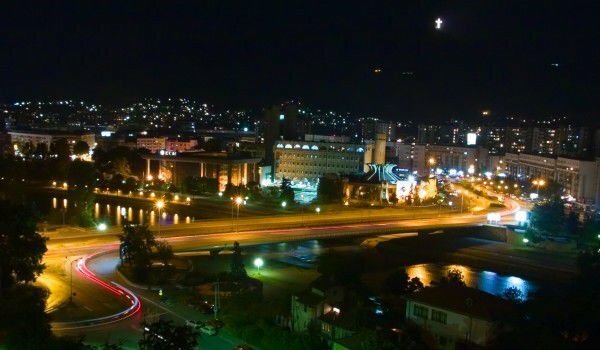 Skopje is beautifully situated on both banks of the Vardar River. Its small valley allows expansion of the city giving Skopje a population of approximately 600, 000 people. For the first time historical sources mention the city in the area of today's Skopje about 3 century BC, when the ancient settlement Skupi existed. In 164 BC it was conquered by Rome and became the main city of the Dardania area, inhabited predominantly by the tribe Dardanus. In 84 or 85 the colony Flavia Aeliya Skupi were founded of whom then transformed it into a big city. Since ancient times Skopje was an important transportation center because of the roads connecting the North-Western Balkans and Central Europe with the Aegean coast and the port of Thessaloniki (Greece) and those connecting the Black Sea with the Adriatic. The ancient city was destroyed in 518 by the earthquake. Justinian I restored the town and turns it to the archbishopric Justiniana Prima, whose successor is the Bulgarian Archbishopric of Ohrid. In the winter of 593-594, it was destroyed again but this time by the Slavs. In 9th -10th century Skopje was part of the First Bulgarian Empire. In 980, the Roman was named king of Bulgaria and as the place of his residence he chose, Skopje. The city remains the capital of the country until 992 years after the fall of Bulgaria under the Byzantine rule. In 1018 for some time Skopje was a center of Byzantine theme Bulgaria. In the mid-13th century it was the center of the possessions of Konstantin Asen, who was a Bulgarian King from 1257 to 1277. Since the late 13th century, Skopje was the composition of Serbia. During the reign of the Serbian King, Stefan Dusan, Skopje became the capital of the Serbian Empire from 1331-1355. On January 19th, 1392 the city was conquered by the Ottomans, led by Evrenos Bey and its name was, Uskyub. Skopje remains in the hands of the Turks but in 1912 during the Renaissance the Bulgarian community in Skopje was among the brightest in Bulgaria. Bulgarians in the town were among the first to oppose the Patriarchate of Constantinople and raise questions about their own schools to be taught in their native Bulgarian language, further in 1833 Skopje and Samokov were the first cities to have placed a request for Bulgarian priests. In the late 19th century the city Skopje was the third most important economic and administrative center in the then Macedonia, then Thessaloniki and Bitola. The city of Skopje in recent years goes on the steps of developing a modern European city. As the capital of Macedonia, it has numerous historical and architectural monuments, which are provide a quite interesting Tour. Among the main attractions of the city is a stone bridge in Skopje, which is located in the central area of Skopje and connects the old with the new city. 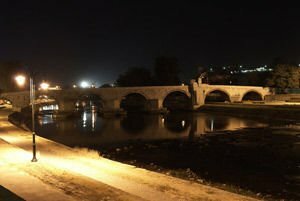 It is believed that the bridge dates from the 6th century - after the disastrous earthquake of 518 and was built by Emperor Justinian I. Among the interesting attractions in the region of Skopje is the Millennium Cross, which was built on the occasion of Christianity in 2000 around the world. This cross is 66 meters high and is located on top of the mountain water, which is south of Skopje. Over Skopje rises Gradiste hill where you can see the medieval fortress of Kale. The Fortress was the vital strategic importance in antiquity and has been preserved to our day. It was built in the 6th century during the Byzantine Empire and is built of stone walls with a length of 121 meters. According to archaeologists, the stone blocks from which the fortress was built, were taken from the destroyed ancient city Skupi. In the old center of Skopje has been restored the Old Skopje bazaar from the Ottoman times. Be sure to view the church of St. Panteleimon in Nerezi of 1164 and its amazing medieval frescoes.